"As storm warnings go into affect for this area, many Triangle residents are getting ready to deal with what Mother Nature may bring". Hummmm, I am planning a weekend full of sewing. No one home and tons of cool strings ready to go. We better not have a nasty ice storm here. Well, if we did I would just stay inside anyway, But Pleaseeee don't let the power go out. I need my sewing machine. Ladies, I love seeing all of your quilts. Keep 'em coming and sharing your pictures and progress. I have teamed up with a group called Moms For Marines to give some of my quilts to. I have had fun following all of your pictures. Good for you for teaming up with Moms for Marines. 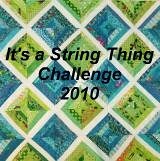 I use a lot of String quilts as Quilts of Valor and they are greatly appreciated too. You are doing a wonderful thing!